I spent my first day in Broome seeing some of the sights. 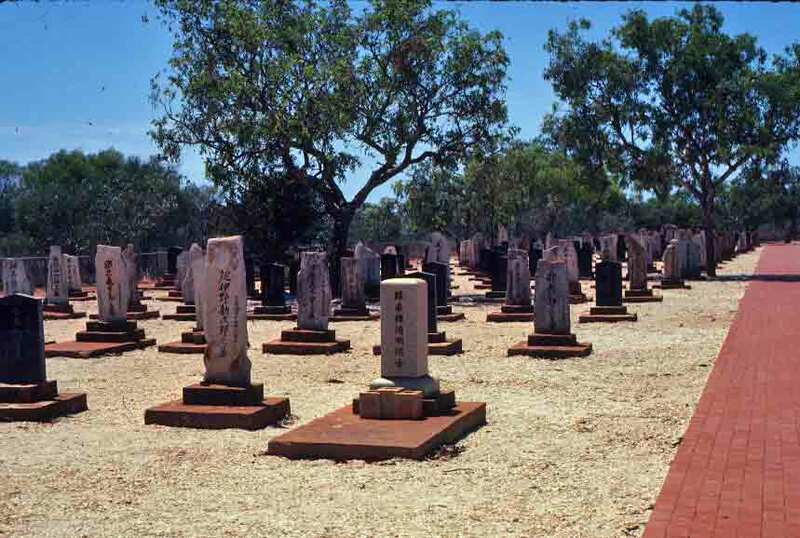 Stuart took me first to the Japanese cemetery. Because Broome has long been a center of the pearling industry, Japanese pearl divers arrived fairly early in Broome’s history. Unfortunately, no one knew about “the bends,” or diver’s paralysis, when pearl diving was in its infancy, so many of those in this elegant little cemetery met this unfortunate end. Next stop was Gantheaume Point, where I got my first view of the Indian Ocean. You can’t see the white sand in the image below, which adds another degree of contrast to the fabulous colors here, but the red rocks against the blue sea still make a pretty vivid color combination. I don’t think it’s hard to see why Broome delighted me. It’s funny the things you learn after a book comes out. When I arrived in Broome—late at night after 21 hours on a bus—Stuart had said that “we put up your tent for you, as we reckoned you’d be tired after your trip.” I assumed “we” was him, and that’s what I wrote in the book—that he had thoughtfully put up the tent for me. As soon as she’d read this in the book, Nikki e-mailed me from Australia to say that it was, in fact, she and Jo who had put up the tent for me. Nikki and Jo, who I would not meet until the morning after my arrival, were the two people on this trip with whom I would maintain long-standing friendships—with whom I am in fact still friends. Nikki thought it seemed we were fated to be friends, since we had in a way connected even before we’d met. And thanks, Nikki and Jo—I was tired, and I did appreciate having the tent ready for me. 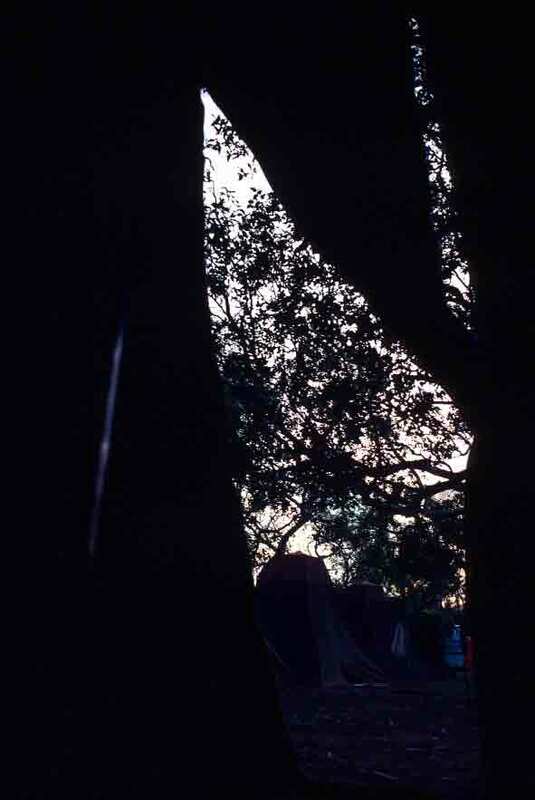 As I noted in the book, my first view of the camp was through the tent flap just before dawn, the next morning. The hint of silver in the sky didn’t lend itself to natural light photography, but I took the shot anyway. So below, my first view of the campsite near Broome, upon awakening that first morning in Western Australia. I didn’t say anything about my trip to Egypt and Jordan — but it was great. I went with Overseas Adventure Travel, which always runs amazing tours. The groups are small (14-16 people), and they always include cool extras, like home-hosted meals, cooking lessons, lectures, and cultural interaction with locals, as well as all the “big” stuff you expect. This is the fourth trip I’ve gone on with Overseas Adventure Travel (OAT). I also did their Morocco trip, their China and Tibet tour, and a three-week Thailand/Cambodia/Vietnam combo. I’m thinking of doing one of their South American trips next year. Or maybe a safari. Or maybe northern India. Sigh. So many places, so little time. The way OAT advertises is primarily by word-of-mouth. Once you’ve been on a trip, you can tell others about the organization — and you can offer discounts. The discounts are $50 off land-only tours and $100 off tours that include a river trip. (Egypt included a four-day Nile cruise, and in China, we spent four days cruising up the Yangtze — but not all trips include river segments.) All you have to do is mention that I sent you to them and give them my customer number — 637771a. That gets you the discount on your trip. Then, once you’ve fallen in love with them, you can give others discounts on their trips. So check them out — http://www.OATTravel.com — and tell them I sent you. I don’t know anyone who has ever regretted taking an OAT trip. After the day at Katherine Gorge, I caught a bus heading west. It was a 21-hour ride, but the scenery and the delightful people on board both contributed to making it more fun than you might imagine. Before dawn, we left the Northern Territory and crossed into Western Australia (WA), the country’s largest state. The northern part of WA is magnificently wild and largely untouched. 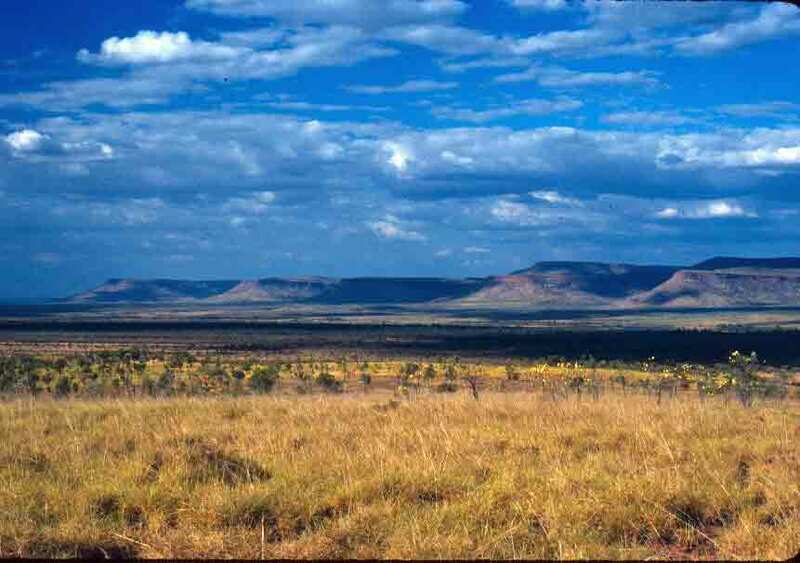 It offers grand vistas of open plains, rocky outcrops, and towering plateaus. I knew as I crossed it that I would need to return someday—and in fact, I did return. During my third trip to Australia, I spent two weeks camping in the northern part of WA—an area known as the Kimberley region, or just the Kimberleys. 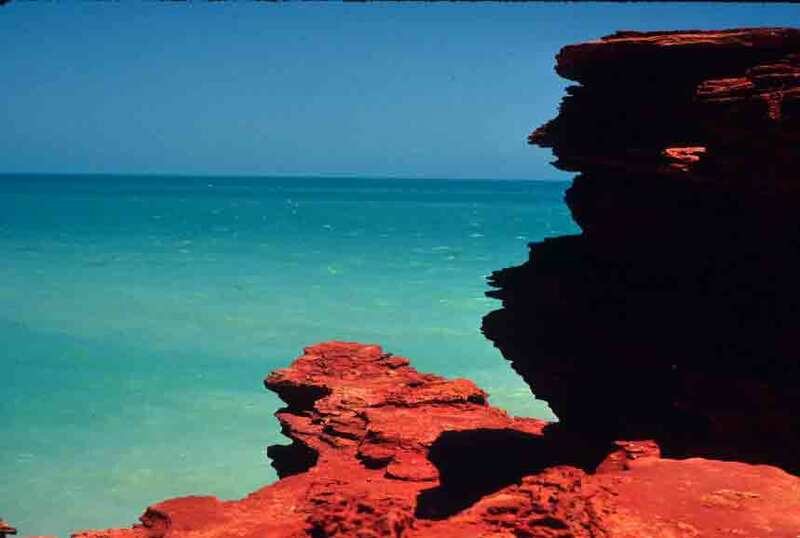 The Kimberley region is three times the size of England, yet is largely untouched, because it is so remote. The photo below, of Home Valley and the Cockburn Range in the Kimberley region, was actually taken on that return trip, but it will give you an idea of the wild beauty that drew me back to this region after my first sighting of it during that long drive to Broome.